In short order, a team of different Children’s doctors had disputed Korson’s working diagnosis of mitochondrial disease for Justina and accused her parents of medical child abuse. This paved the way for the state child protection agency to intervene and strip the parents of custody on an emergency basis. From there, Justina, against her strong objections, was moved into the hospital’s locked psychiatric ward. Children’s and the state had ignored Korson’s requests to be included in a roundtable meeting to discuss Justina’s care. Staring at his desktop computer, surrounded by a sea of paperwork and multiple coffee mugs personalized with photos of his young son, Korson started to type. The 55-year-old doctor was getting daily calls from Justina’s parents, Linda and Lou Pelletier of West Hartford, Conn., each one more frantic than the last. Yet he felt he had no answers for them. “I am growing increasingly uncomfortable with the process at Children’s Hospital to evaluate Justina,” he wrote to the girl’s court-appointed attorney. 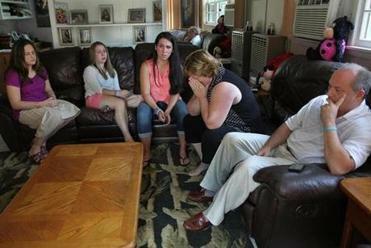 In July, Justina Pelletier’s family was rattled by a phone call from the state child protection agency saying it was ready to release the 14-year-old from Boston Children’s Hospital — but not into her parents’ custody. Justina’s hospitalization is the most extreme of a handful of unusually contentious cases over the last 18 months involving Children’s Hospital and the Department of Children and Families. A Globe review of these and other cases nationally has found that most involve a disputed medical diagnosis, charges of parental misconduct filed or threatened by the hospital, and the inability of the state child-welfare agency to provide effective intervention. At issue in these cases is also the use of a controversial term, medical child abuse, that can be leveled against any parent who is perceived to be acting against the best interests of his or her child in a medical setting. Child protection specialists stress how much children can suffer at the hands of parents intent on “over-medicalizing” or interfering with their care. But parents, including the Pelletiers, contend they were hit with these charges simply because they disagreed with the hospital’s diagnosis and wanted to take their child elsewhere for treatment. The problem is that there are few good paths to resolution once doctors are convinced that parents are harming their child. The tools available are exceedingly blunt and emotionally inflammatory: The system basically requires doctors to suggest the parents are unfit and may deserve to temporarily lose custody of the child, as well as any voice in the child’s treatment. The Department of Children and Families is supposed to referee such disputes, but the agency is ill-equipped to intercede at the highest levels of medicine. Across the entire state, the DCF staffers with formal medical training consist of just one half-time pediatrician, one half-time psychiatrist, and a handful of nurses. Five years after the Legislature approved funding for a physician medical director, the agency has yet to fill the slot. Instead, the agency regularly turns to doctors in the medical mecca of Boston for free consults. Its deputy commissioner acknowledges that, given Children’s standing as one of the world’s top pediatric hospitals, the state often looks there first for assistance — which can create at least the appearance of a conflict of interest when the agency is weighing abuse allegations brought by the hospital. At issue in these cases is also the use of a controversial term, medical child abuse, which can be leveled against any parent who is perceived to be acting against the best interests of their child in a medical setting. After Justina had been missing from school for several weeks without explanation, her friends began leaving worried, tearful messages on her cellphone. When Justina finally mustered the strength to call them back, they were relieved. “I miss you,” her friend Hannah Goldberg said. “I miss you, too,” Justina replied. The Pelletier family — sisters Jessica, Julia, and Jennifer and parents Linda and Lou — were told by a state child protection official that it was “not safe” for Justina at their home. During the year before her hospitalization, when she attended a private school in Connecticut designed for children with learning disabilities, Justina had forged close friendships. And those classmates were desperate for answers, as were her friends from an ice skating club. When Justina returned a call from Jenelle Miller, her closest skating friend, to wish her a happy birthday, Jenelle said later, it was the best birthday gift she could have received. As for Justina, she had been looking forward to celebrating her 15th birthday in May back home in West Hartford. Instead, she had to resign herself to the reality that it would be some time before she left Bader 5, the name of the hospital’s 16-bed locked psychiatric unit. She spent her days in bed in her private room or in one of the ward’s common rooms for study hall or activities such as arts and crafts and movie night. She used a wheelchair to get around the corridors, because she hadn’t been walking since before she arrived by ambulance in February. Only the broad outlines of her life in Bader 5 are known. Officials at the state child protection agency and Children’s Hospital, as well as her current and past doctors, would not discuss her care, citing patient confidentiality. Still, the Globe obtained extensive hospital, agency, and legal records in her case, as well as dozens of e-mails among the parties, and interviewed others involved in her life to more fully tell her story. Justina repeatedly told staff she wanted to go home, but the decision did not rest only with Children’s. A hospital spokesman said the facility “seeks to transfer patients to less medically intensive environments as soon as they are medically ready and a location is available.” The exact location however, would be up to the state child protection agency. Bader was generally library-quiet. The security and oversight were tight, because the unit specializes in treating children and teens with depression, schizophrenia, eating disorders, and other serious psychiatric illnesses that might make them a threat to themselves or to others. In the beginning, Justina’s parents were allowed almost daily visits. But that would not last. On the morning of May 9, Korson made his way through the enormous revolving door into the Children’s lobby and took the elevator up to Bader 5. Up until this time, he had a few e-mail exchanges with Children’s doctors about Justina, but they seemed to go nowhere. Now, after three months of asking, the Tufts doctor had finally gotten an invitation to visit the hospital to discuss Justina’s case. But the meeting turned out to be far from the wide-ranging summit involving all the key players that Korson had been requesting. Besides him, there were only two people in the Bader conference room: the unit’s psychiatrist, Dr. Colleen Ryan, and a social worker. Korson was not invited to see Justina or discuss the fundamental medical disagreement with any of the doctors who had disputed his working diagnosis for her. Still, Korson seemed to take the invitation as a hopeful sign, according to e-mails obtained by the Globe. It wouldn’t take long to quash that optimism. Just a few hours after Ryan finished up with Korson, the Children’s psychiatrist had a meeting with Justina’s parents and the state agency staff handling the case. The state workers began with a bombshell. They informed the Pelletiers that they would no longer be allowed to have daily visits with Justina. Henceforth, they would be granted just a single hour-long visit each week, on Friday afternoons. The agency cited disruptive behavior on the part of the family, records show. During one visit with Justina, Linda had held needles in her lap. When confronted by staff who insisted she put them away, she complied and explained they were for her diabetes. Linda described the needle incident to the Globe as an innocent mistake. With that confrontational tone set, the meeting soon erupted into a screaming match. Before long, agency manager Suzanne Hauck instructed security to remove the Pelletiers from the meeting. Once outside, the parents called Boston police to complain. “It was not a punishment,” the psychiatrist countered. The roots of the hostility between Justina’s parents and the child protection agency could be traced back to the first days of its involvement in the case. In February, the morning after the Valentine’s Day drama when the state had taken emergency custody of Justina at the request of Children’s, the Pelletiers, had appeared in juvenile court to ask for their daughter back. One of the key pieces of evidence presented to Juvenile Court Judge Joseph Johnston had been an affidavit filed by a state social worker, following her interviews with all the major parties. The affidavit showed considerable deference to Children’s. It quoted liberally from hospital records and interviews with staff members there, including accusations that Justina’s parents were obstructing her care. It said the Children’s doctors “do not know where the parents picked up the current diagnosis and they are hard to disprove.” It included negative comments from Justina’s Connecticut pediatrician about how Linda and Lou had “fired” multiple doctors and “encouraged” the diagnosis of multiple medical problems. However, the affidavit failed to mention that the social worker had interviewed Korson, and that Korson had explained the origins of the working diagnosis of mitochondrial disease that he had given Justina. Internal state records show that Korson had explained that the disorder sometimes runs in families and that he had also been treating Justina’s older sister for it. When the judge decided to maintain temporary custody of Justina with the state, the Pelletiers were furious. They took their complaints to every authority they could think of: the district attorney, the attorney general, the governor’s office, even the FBI. They alleged that Children’s was using its considerable muscle to box them out at every turn. When the parents received an e-mail from the person the judge had appointed as an independent investigator to advise him in the case, they were outraged to see her list an affiliation with Children’s in the e-mail. Still, for the family, not all the news out of Children’s was bad. The most encouraging sign had come in May, not long after Korson’s meeting there. A three-person hospital ethics committee, convened at the request of the Pelletiers issued a decidedly measured report on Justina’s case. Written by Christine Mitchell, director of the hospital ethics office and associate director of clinical ethics at Harvard Medical School, the report said Justina appeared to be “getting better,” and was now able to sit upright in her chair and bear weight while standing, though she was still not walking. Yet it acknowledged some contradictions in her care at Children’s. For instance, early on the staff had been suspicious of Linda’s demand that her daughter get a temporary feeding tube in order to increase her nourishment. But immediately after the parents lost custody, the report noted, Children’s had determined that the feeding tube was indeed medically necessary and Justina was given one. The report said Justina sometimes talked about wanting to go home. “Her views, as a teen growing into eventual adulthood,” the report said, “should also be included in assessing her interests and decisions about what is good for her.” It recommended that the key players “explore ways of regaining trust and a working alliance between Justina’s family and hospital caregivers,” by “obtaining an outside medical review and evaluation” and gradually increasing parental visitation rights. Tellingly, though, the report concluded by noting that it was only “advisory.” As for its recommendation that Justina’s case be reviewed by doctors outside Children’s, previous efforts to do that — first at Tufts, then at Baystate in Springfield — had already fizzled. Hospitals can be reluctant to join in such reviews in cases where a family’s behavior has been difficult and full reimbursement by insurance is in doubt. But the family blamed Children’s for dooming these efforts. Getting a fresh start at another hospital had been the key to resolution in a previous, highly contentious case at Children’s. The day before Justina had been moved into Bader 5, a 16-year-old girl named Elizabeth from upstate New York had been discharged from that same unit, after she had been in state custody at Children’s for more than six months. Elizabeth’s case had also hinged on a dispute over whether her problems were physical or psychiatric. However, in her case the disagreement involved a different controversial illness, something called PANDAS or PANS, an autoimmune neuropsychiatric disorder believed to cause obsessive compulsive disorder. That dispute had led to allegations of medical interference being filed against the girl’s parents and to the state taking custody of the girl. And the representative from the Children’s psychiatry service who played a key role in Elizabeth’s case was the same psychologist who had pushed to change Justina’s diagnosis to somatoform disorder, Simona Bujoreanu. In the end, as part of an agreement forged by the juvenile court, the state child protection agency, and the parents’ attorney, Beth Maloney, Elizabeth’s care had been moved to a team at Massachusetts General Hospital, and her parents had agreed to get an apartment in Boston. But five months into Justina’s saga, there was no hint of a similar path toward resolution. Sitting on the leather couch in the family room on a steamy July day, Justina’s 19-year-old sister, Julia, struggled to tune out the angry voices crackling through the phone that was on speaker mode and resting in her mother’s lap. As the conversation between her parents and state agency staff became more heated, over new hospital restrictions, Julia distracted herself by fiddling with the handmade bracelets that Justina had made for her in the hospital activity room. By the time it turned into shouting, Julia’s eyes were welling up. She was anxious to speak with her little sister by phone. But amid all the screaming, she felt that opportunity slipping away. “Will you shut up for a minute, Suzanne, and listen?” her mother barked. Julia had just finished up her first year as a commuter student at the University of St. Joseph in West Hartford. She had long shared a bathed-in-pink bedroom with Justina, so every morning she woke up missing her sister. Because Julia’s schedule made it difficult for her to travel to Boston on Fridays for the family’s weekly visit to Children’s, she viewed these 20-minute, twice-a-week phone calls as her lifeline to Justina. After more loud backtalk, Hauck found a moment to announce some “good news.” Justina, she said, had progressed to the point where she was ready for discharge. “She’s not going home,” Hauck replied. A few minutes later, the Pelletiers’ phone rang again. “You’re the best mommy. . . . I love you so much,” Justina said. After waiting patiently, Julia, her face framed by her blond hair and a hopeful smile, finally got her turn to hold the phone. Since Julia and Justina were the two youngest of the four Pelletier daughters, they shared not just a bedroom but lots of friends. Julia caught her up on some of those friends, who were still regularly calling in tears to find out what had happened to Justina. Julia bounced up from the couch and headed over to the upright piano about 10 feet away, as the family’s hulking German shepherd trailed her. When Julia began playing “Twinkle, Twinkle Little Star,” Roxie began moaning along, her snout pointed toward the ceiling. Justina laughed appreciatively. Julia smiled. Over on the couch, Linda sat with her face in her hands, quietly sobbing. Finally, a month later, came the kind of large summit that Korson had been asking for. Yet, once again, Korson was excluded. There didn’t appear to be much of an appetite at either Children’s or the child protection agency for revisiting the medical disagreements at the root of Justina’s care. Instead, their focus seemed to be on the future. Justina had been at Children’s for more than six months now, with few signs of marked improvement, racking up a big bill for the state because she remained in its custody, her care covered by MassHealth. The true size of that bill is unknown, but Children’s said their average cost of inpatient psychiatric care is almost $2,000 a day, though for patients on MassHealth, the hospital is paid less than half that amount. Clearly, Justina couldn’t stay there forever. But where would she go? Among the fresh faces participating in the meeting was Gail Garinger. Few would seem better situated to understand the complexity of Justina’s case. In the 1970s, Garinger worked for Children’s, first as the lawyer assigned to its then-new child protection team and later as general counsel. In 1995, she had been appointed as a juvenile court judge. And in 2008, she was appointed by the governor to the new statewide position of child advocate. Lawmakers established the watchdog position in response to two high-profile cases in which parents managed to manipulate the medical system while under the child protection agency’s watch: A 4-year-old Hull girl was killed by an overdose of psychotropic drugs, and an 11-year-old Westfield girl nearly died of overlooked long-term physical abuse. Garinger’s mandate was wide — to look out for vulnerable children who were in the state system — but her resources were spare. She had just three employees, and limited statutory powers. When Justina’s mother had begun making regular calls to Garinger’s office in the spring, Garinger’s mind had flashed back to a controversial case she had been involved in during the late 1970s, when she was still working as a lawyer for Children’s. It involved a 12-year-old boy dying of brain cancer, whose parents were insisting that he be given laetrile, an unproven treatment made from apricot pits. When Children’s refused, the parents filed suit, and ultimately, in a behind-the-scenes compromise, the boy was able to receive laetrile in addition to conventional treatment. The laetrile case was a battle between traditional medicine and alternative medicine. In other cases when Christian Science or Jehovah’s Witness parents refused to bring their ill children to hospitals, it was a standoff between traditional medicine and religious freedom. In cases such as Justina’s, however, traditional medicine was at war against itself. These fights also highlighted something Garinger had been pushing without much success during her tenure as child advocate: the need for more medical expertise at the child protection agency. Justina’s parents had been allowed to participate in a portion of the meeting, and the hardened positions between the two sides were clear to everyone around the table. Garinger tried to find common ground. 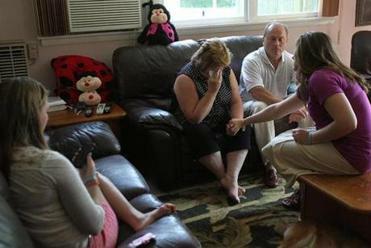 The state was still insisting that it was not safe to release Justina back to her parents’ care, fearful they would return to focusing on treatment for mitochondrial disease and ignore her psychiatric needs. Because of her continued medical problems, a traditional placement in a foster home did not seem advisable. The fireworks-free summit ended without a solution, but with a spark of promise. The Pelletiers agreed to tour a residential facility in New Britain, Conn., that catered to teens with both behavioral and complex medical needs. Lou had originally rejected that idea because he remembered it as a former orphanage. The new school year began with Justina in the same place she had been for the past seven months. Justina’s parents now pinned their dimming hopes on a custody trial that would eventually play out in juvenile court. A couple of months before the summit, Alice Newton, the pediatrician who had served as medical director of the Children’s child protection team during much of Justina’s hospitalization, left the hospital to work full time at Mass. General. She had said that when children who are victims of alleged medical child abuse are removed from their parents’ care, the picture can improve quickly. “In a number of cases where we’ve actually done that, you see the child just blossom in front of your eyes,” she said. Carole Jenny, a national leader in child protection, had made a similar comment in an interview. Justina, however, did not seem to be blossoming. Based on their regular visits, Justina’s parents and sisters report that she remains very weak and unable to walk, and she continues to require medical intervention for bowel movements. Although it’s been impossible to obtain an independent assessment of her current state, descriptions of her condition in state and hospital records — such as the former figure-skater’s ability to lock and unlock her wheelchair — attest to the modest nature of any improvement. And months after Newton had left Children’s, the hospital administrator overseeing the hospital’s child protection team disputed the notion that children in these cases rapidly improve once they’ve been removed from a medically abusive situation. And what about the psychiatric diagnosis of somatoform disorder that psychologist Simona Bujoureanu had given to Justina and that the state had, in turn, insisted her parents accept if they wanted to regain custody? Dr. David DeMaso, the hospital’s noted psychiatrist-in-chief, points out that the mental health field has largely moved away from using somatoform disorder as a useful diagnosis. “It was kind of vague,” he said, noting his preference for “somatic symptoms,” which allows for more flexibility in diagnosing it in conjunction with other illnesses. Asked in an interview to explain how parents could be told that they had no choice but to accept the hospital’s diagnosis of somatoform disorder as a condition of regaining custody, DeMaso stressed that it wasn’t up to Children’s to determine custody. “That’s DCF,” he said. In the bitter cold of last Thursday morning, on the final day of the trial to determine Linda and Lou Pelletier’s fitness as parents, Juvenile Judge Johnston prepared to hear testimony from the witness at the center of it all. 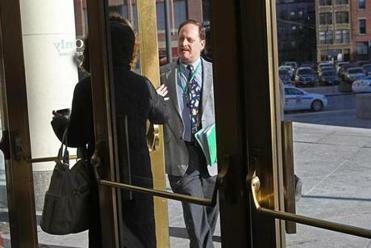 Justina was wheeled into the fourth-floor courtroom of the Edward Brooke Courthouse in Boston. For the first time in this protracted case, the 15-year-old girl appeared in a courtroom to weigh in on her own future. Improbably, her hospitalization had consumed almost an entire year of her life. Korson, her doctor from Tufts, was the next scheduled witness. A gag order prohibited any of the parties from disclosing what anyone said on the stand. The judge is expected to issue his ruling as early as Friday on whether Justina will be returned to her parents. While she and her family wait for the news, Julia Pelletier continues to wake up each morning to a painful sight. When she and Justina had begun sharing a room years earlier, they both loved all things pink. But as Justina’s tastes had changed, she had lobbied her sister to repaint their room blue. Julia had steadfastly refused, happily exercising the privileges of seniority. Neil Swidey can be reached at swidey@globe.com. Patricia Wen can be reached at wen@globe.com. Follow Swidey @neilswidey and Wen @globepatty.